Our solar system is just like a drop in the ocean within our milky way galaxy. Our planet Earth is very tiny within our solar system. The individual human beings are not even the size of dots on Earth. We should not consider ourselves insignificant in the vast universe. We can consider us to be actually a part of this grand universe and so we are as significant as the universe. This realization is a starting point for us to feel true love and respect towards fellow human beings and all other life forms. Above all, we need to feel good about our own selves. Coming back to our galaxy, milky way is a spherical galaxy with its arms spiraling outward. The solar system is located in one such spiral arm. Want to know the position of Earth in the milky way? We are located at a distance of about 27,000 light years from the galactic center. 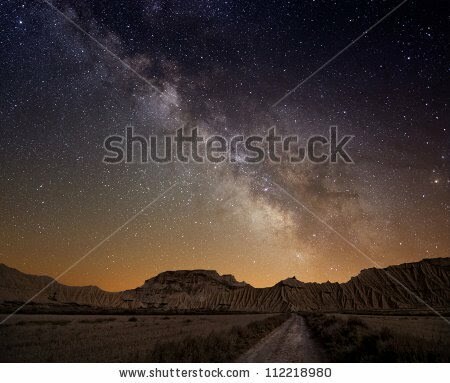 The nearby arms of milky way are visible as a fuzzy band of light arching across the sky. We cannot differentiate the individual stars in this band. This band is visible only from very dark locations and not in the light polluted skies of urban or suburban areas. Our milky way has a huge black hole, a region with a huge concentration of matter, at its centre, All the stars in the milky way go around this black hole just like the solar system planets go around the Sun. Milky way galaxy has billions of stars like our Sun. The nearest star to our Sun is called proxima Centauri, a red dwarf star not visible to naked eye. Its two other companion stars called Alpha Centauri and Beta Centauri are prominently visible in the Southern hemisphere and also from the mid-northern latitudes. The universe has billions of galaxies, a number that I can only say but not comprehend. The closest galaxies to us are the large Magellanic cloud and the small Magellanic cloud. These are also called dwarf galaxies. The Magellanic clouds are believed to be satellite galaxies of milky way orbiting our milky way galaxy. The Magellanic clouds are visible only from Southern hemisphere. For the northern hemisphere observers, Andromeda galaxy is visible from dark locations on Moonless nights. It is amazing that we could spot a galaxy that is located 2.5 million light years away with just our eyes! The universe is filled with billions of galaxies. Each galaxy is filled with billions of stars. One such galaxy is our home called "milky way". 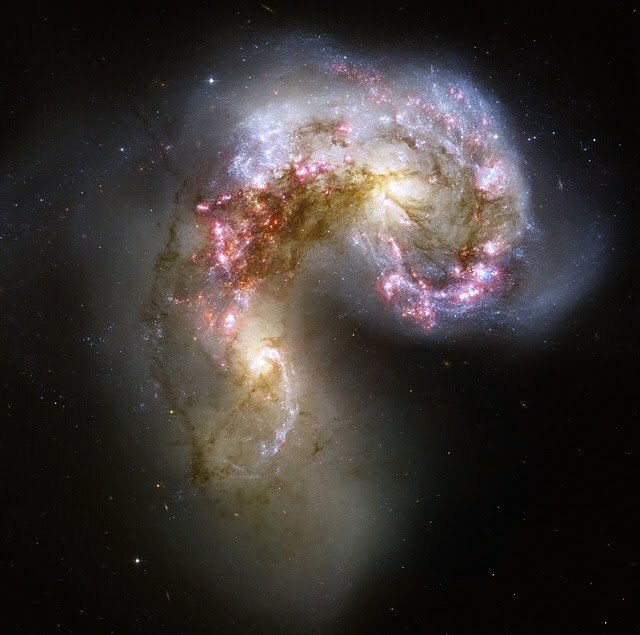 The picture on the left is that of "Antennae galaxies", located at a distance of about 65 million light years from Earth. This is actually a pair of interacting galaxies code named NGC 4038 and NGC 4039. If we conduct a beauty pageant for celestial objects, the galaxies and nebulae would sweep all the prizes. The stars, planets, moons and even comets would stand no chance against these two beauties. Galaxy is a group of stars bound together gravitationally. A nebulae is a nursery within a galaxy giving birth to new stars.